The Washoe County Sheriff's Office provides law enforcement services for the unincorporated area of Washoe County. We also are responsible for operating the only adult detention facility for pretrial detainees and sentenced misdemeanants within Washoe County. The Agency has an authorized strength of 412 commissioned, 283 civilian, and 56 intermittent hourly employees. We also have 11 active Reserve Deputy Sheriffs and a volunteer corps of 422 persons. The Sheriff's Office has an annual operating budget of $119M and has over $5M in restricted funding such as grants and donations. The Sheriff's Office is divided into three Bureaus. While each Bureau/Division has a unique function, they impact the operation of the other Bureaus/Division. The Administrative Bureau includes Background Investigations, Community Engagement, Training, Fleet Services, Research and Development, Records and Civil Sections, Dispatch, oversight of the Regional Public Safety Training Center, and the Forensic Science Division (Crime Lab), including the Forensic Investigation Section (FIS), as well as the Evidence, Breath Alcohol, Controlled Substance, Firearm & Toolmark, and Toxicology Sections, and the Biology Unit..
WCSO MISSION STATEMENT - Dedicated to preserving a safe and secure community with professionalism, respect, integrity and the highest commitment to equality. 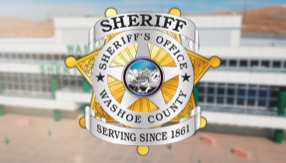 WCSO VISION STATEMENT - The Washoe County Sheriff’s Office strives to ensure public safety by building trust and creating partnerships within the diverse communities in which we serve. We will promote the dignity of all people supported by our words and actions through open communication while fostering an environment of professionalism, integrity and mutual respect.